Kinley provides in-depth and hands on experience to create a safe and efficient environment, necessary to carry out successful project operations. 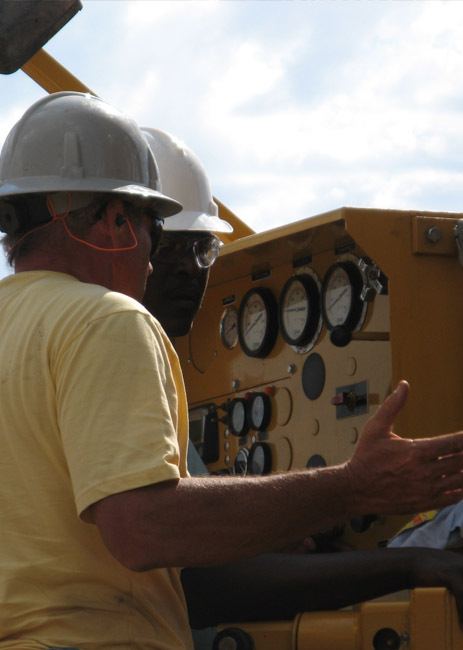 The company provides high quality personnel, including supervisors, shown here providing instruction on how to safely drill a CBM well in Sub-Saharan Africa. Kinley will provide quality personnel experienced in hands on operation and training of regional staff. We will also provide project specific tooling, rigs, completions gear and the qualified personnel to either operate equipment full time, or to provide qualified training and proven operational knowledge. Whether training crews for deep wireline coring for heavy oil, underbalanced drilling for CBM, hydraulic mining for uranium, hydrofracturing wells or providing cementing technology, Kinley can provide the experienced crews and supervisors to get the job done safely and efficiently.